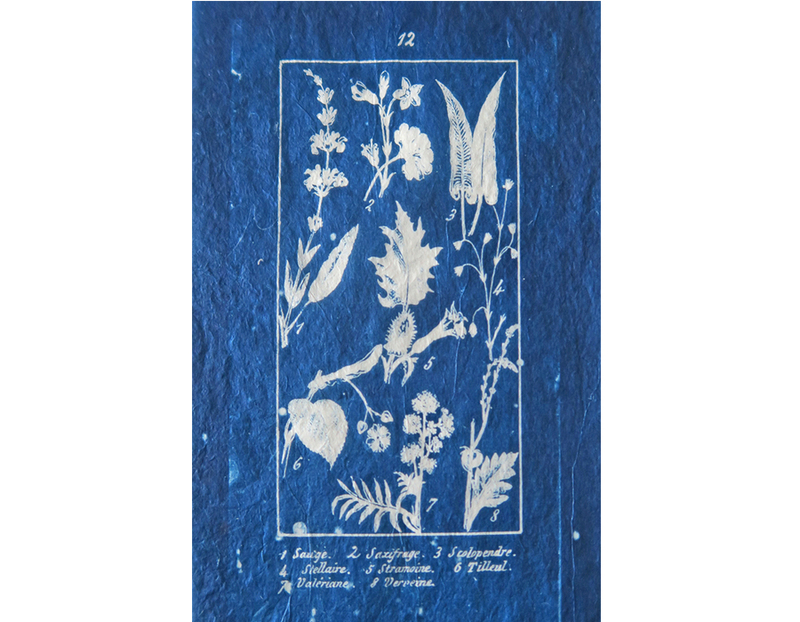 Penelope Stewart, Botanique, 2018, artist book, cyanotype, 1/1. Photo courtesy of the artist. Penelope Stewart, Plate 11, 2018, cyanotype on Tosa Washi (Japanese paper), edition 1/10. Photo courtesy of the artist. 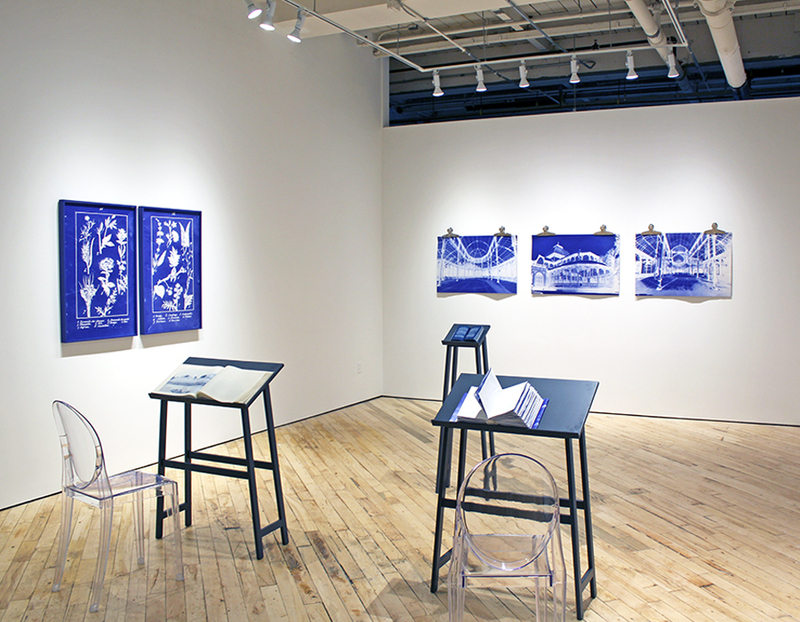 Penelope Stewart, Plate 12, 2018, cyanotype on Tosa Washi (Japanese paper), edition 1/10. Photo courtesy of the artist. Each year, Open Studio awards two yearlong residencies to artists of merit. The Nick Novak Fellowship is awarded to an artist currently involved with Open Studio as an artist member. Recipients are provided with rent-free access to Open Studio facilities for a period of one year, a materials allowance, professional development assistance, and tuition-free access to Open Studio’s education program. This exhibition is a result of this intensive work period. Stewart has been photographing and researching Victorian conservatories as utopian architectures not only for their formal attributes of construction but also as sites that position and re-position the natural world. While they stand as museums, monuments, and theaters, nature undergoes a process of displacement, diminution and transplantation, lodging the glass structures in our collective memory as a replacement for Eden. Echo Utopias is a bound collection of hand printed photo-lithography prints utilizing Stewart’s many photographs and research as source material. Botanique, the book from which the title of the exhibition is derived is a small found book on early botany of the 19th century. 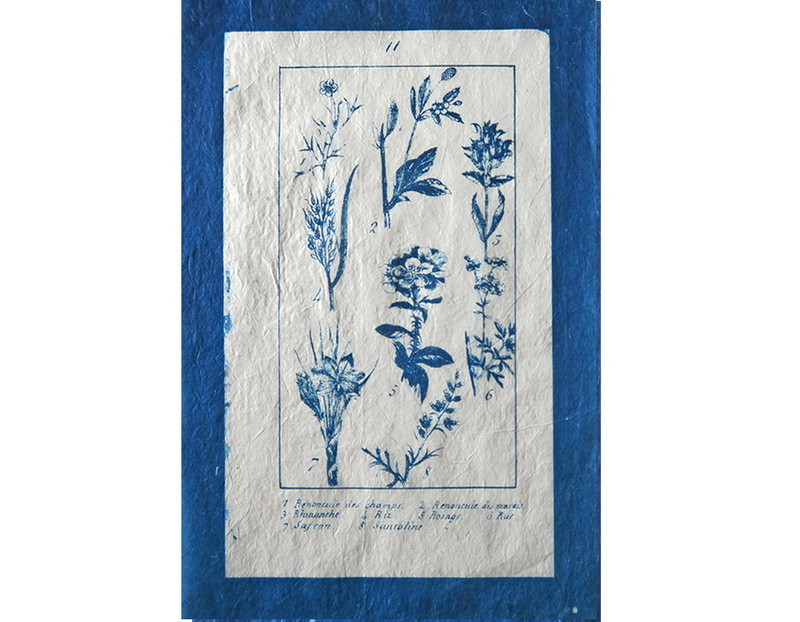 The book was in bad shape, but it captured Stewart’s imagination and she decided to copy each page using cyanotype, the blue print process, which strongly references Anna Atkins, a 19th century botanist and early photographer. 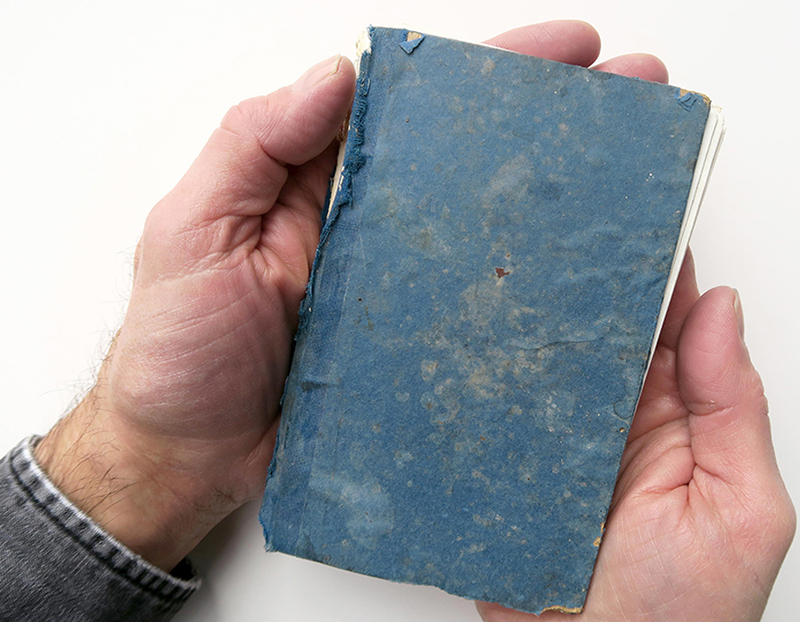 Using Stewart’s cyanotype pages, the book was then rebound in the original binding. The final artist book in the exhibition is Stewart’s cloud atlas. Once again Stewart mines her collection of photographs this time of clouds. These images were reproduced in a large format as diazo prints, and like maps, folded and bound. Penelope Stewart was born in Montréal, Québec. She received an MFA from the State University of New York at Buffalo, and in 2010 she was elected to the Royal Canadian Academy of the Arts (RCA). Her work has been exhibited at such notable institutions as The Albright-Knox Art Gallery, Buffalo New York; Musée d’Art de Joliette, Québec; Lotusland, Montecito, California; Musée Barthétè, France; Koffler Gallery, Toronto; Oakville Galleries, Ontario; ACT Museum, Canberra, Australia; Poimena Gallery, Tasmania, Australia. Stewart has received numerous grants and awards from the Canada Council, the Ontario Arts Council, and the Toronto Arts Council. In 2009 Stewart received First Prize for her photo-based works at the Centre for Perceptual Arts (CEPA) Buffalo, New York, and at Photo-Op, Ontario. In 2016 Stewart received a commission from Maison Alexandre Stern in Paris, France and in 2019 she will be returning to France to complete a second large commission at Musée Barthétè. 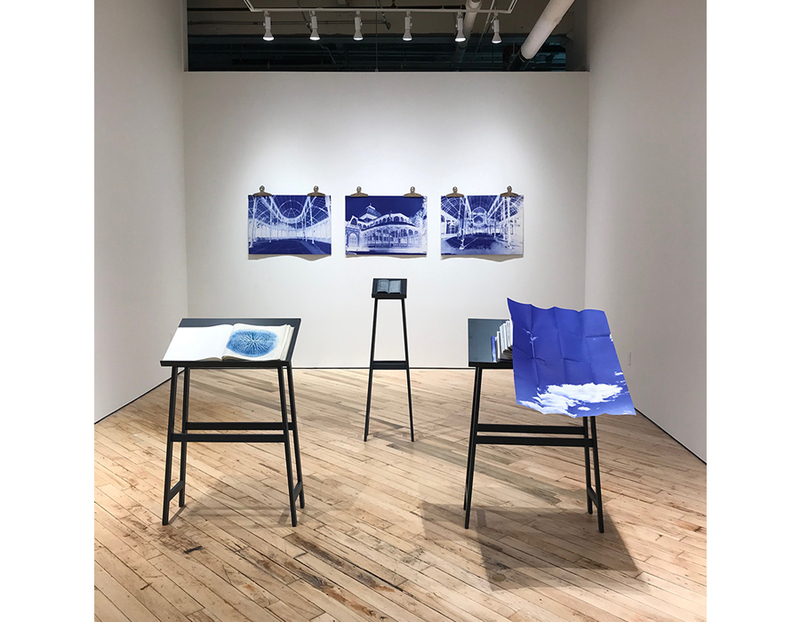 The artist would like to acknowledge the excellent information, tips, and help she received from Sally Ayre (cyanotype), Pudy Tong (photo lithography), Laine Groeneweg (diazo printing) and Reg Beatty (book binding). A special thank you to the Nick Novak Fellowship for an amazing time spent at Open Studio immersing myself in print culture.